Our tourist enterprise was founded in 1983 and has specialised on complete experience-services for people of all ages. We offer accomodation in holiday-residences, restaurant-service, facilities for conferences, parties, saunas and services for all kinds of happenings. Get yourself familiar with our services and get into touch, we would be pleased to tell you more about our services. 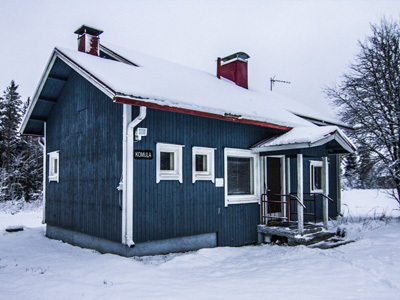 At Maanselän Etappi you will find accomodations that fit every taste. The holiday cottages are situated near a lake and surrounded by a peaceful nature. They are in use throughout the year. The Komula farmhouse was built in 2005 and designed for bigger groups. 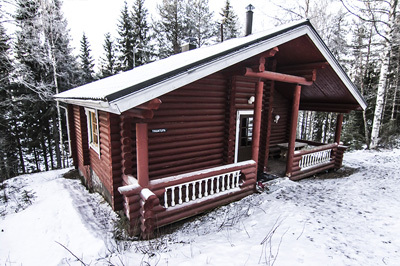 Whatever accomodation you choose, you will always be in the middle of original kainuu nature and hospitality. Size: 10+5 pers. (110 m2). 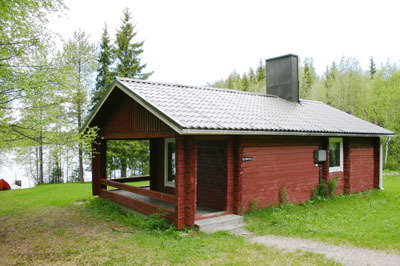 Location: Distance to the lake 15 m and to the main building 310 m.
Equipment in the holiday-accomodation: bedlinnen, 12 pcs kitchen-set, electr. heaters, airconditioning, central vacuumcleaning, hot and cold water, electr. 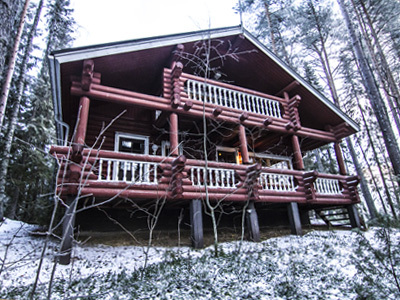 kitchen-stove, micro-wave, coffee-machine, toaster, refrigerator, dishwasher and washing-machine, shower, 2 WC, sauna fired by wood, fireplace, text-TV, videoplayer, cassette radio, boat. Neighbourhood: Nature-friendly broadleaf and coniferous forest. Location: Distance to the lake 15 m and to the main building 250 m.
Equipment in the holiday-accomodation: bedlinnen, 10 pcs kitchen-set, electr. heaters, airconditioning, hot and cold water, micro-wave, coffee-machine, toaster, refrigerator, dishwasher and washing-machine, shower, WC, sauna fired by wood, fireplace, text-TV, cassette radio, boat. Location: Distance to the lake 15 m and to the main building 200 m.
bedlinnen, 6 pcs kitchen-set, lectr. heaters, hot and cold water, electr. stove, micro-wave, coffee-machine, toaster, refrigerator, shower, WC, sauna fired by wood, baking oven, colour TV, radio, boat. The farmhouse Komula has been repaired in 2005 and is situated approx. 1 km off Etappi in an idyllic country-life surrounding. Accomodation for 15. A special place for staying overnight and for small groups. Location: 600 m to a public bathing beach (good, safe road), 1 km to the main building of Etappi. Equipment: bedlinnen, 15 pcs kitchen-set, electr. heaters, airconditioning, hot and cold water, electr. stove, micro-wave, coffee-machine, toaster, refrigerator, freezer, dishwasher and washing-machine, spin dryer, shower, 2 WC:s, sauna fired by wood, baking oven, TV, radio, boat on bathing beach. Neighbourhood: Farming, cultivated farm land and forest. We have a daily offer of tasty home-made food made of clean Finnish raw material. You can start with a breakfast, pay a visit at lunch and have a delicate dinner. Have a try and enjoy the original taste in the meat, fish, vegetables, berries and bread. Don´t forget our home-made bakery which melts in your mouth, and which goes with coffee or without. It´s a pleasure for us to arrange conferences and special events in our undisturbed and clean facilities. Tasty food and a pleasant surrounding help our guests to enjoy their stay. Every July we arrange summer parties with plenty of Finnish programmes and delicious food. This year the events will take place on July 10th. Enjoy the Finnish atmosphere! Have a look at our domestic animals! With us you can find paws, webs, claws, hoofs, furs and feathers, something to see and experience for everybody and every age. At your request we arrange exhibitions of traditional heritage. Become acquainted with old Finnish work habits, such as wool spinning, churning, grain milling by hand or roasting coffee beans. The terrain at Maanselän Etappi is ideal for hiking tours: the UKK hiking path winds smoothly over hills, shelters and gallow sheds serve as resting-places. You can make yourself acquainted with history by visiting the Täyssinä peace frontier stone some kilometers away. 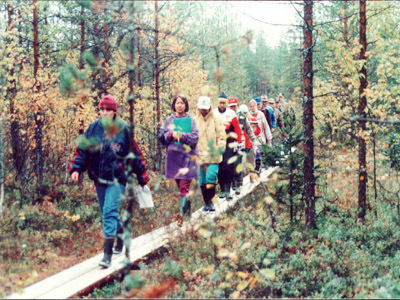 The UKK hiking path was named after the former president Urho Kekkonen, who wandered this route in 1957. This hiking path is also part of the European long distance hiking path (Euro hiking path E 10), which starts in Nuorgam and ends in Gibraltar. 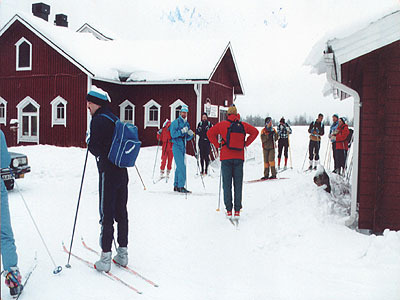 For skiers the vicinity of Etappi offers wild landscape and peaceful nature. Skiing tracks (4 km and 13 km) wind in the neighbourhood of Etappi. Everybody can find a suitable track for him- or herself. At your request we also supply you with a snack for your skitour. 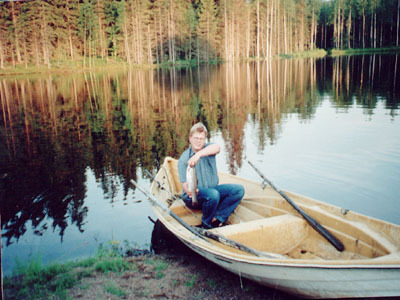 There are numerous lakes and ponds around Etappi within a radius of 10 kilometers where one can catch also big fish. Bring us the fish and we´ll fix you a delicious meal. Drive a reindeer for a try in our yard and afterwards leave for a ride into the forest. 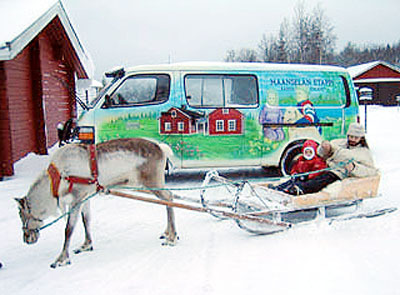 Our team-reindeer Petteri is so gentle that even children could make a ride with him. At the end of the reindeer ride the driver will receive a reindeer driving licence. Contact us and come to MAANSELÄN ETAPPI!